Goals are good things, even if they don’t fall into place quite where one intended. Over the weekend I thought I’d become some sort of organized blogger this week with posts like OTN – Tuesday or FO – Friday like some of my more clever friends. Yesterday was taken up with hours of plugging in codes and posting photos of the Oklahoma yarns, which still seemed to leave today for OTN – Tuesday, until this morning when I realized yesterday was Tuesday. In perseverance I’m declaring today OTN – Tuesday on Wednesday. Two new projects have been getting all of my devotion for the past week, well knitting time devotion. When I cast the first one on Chris asked me if I was spreading myself too thin. I asked him what he meant, and he asked something he’s never asked before, “How many knitting projects do you have going?” I was kind of gobsmacked by his audacity. The first time he asked I blustered through without giving him a real answer. The second time he asked the same question as I cast on the second project I ticked them off on my fingers – using two hands. I didn’t even include some projects that I haven’t laid eyes on in months. Then I gave him the stink-eye. And I kept knitting. What has me so enamored? Two new designs! The Winfield guitar festival is one of the festivals that just boggles my mind every year. RV’s, campers, tents, guitars, and tie dye as far as the eye can see. And music 24 hours a day for several weeks leading up to the main event. Then it’s an all out bluegrass-apooloza for the four days of the main festival. There are several different stages, each with their own personality. And the same story exists for the different camping groves. August at the farmers market means grapes. Claudia, who is one of the sweetest souls you’ll ever hope to meet, grows amazing table grapes. I adore grapes – chilled grapes, grape jelly, and yes – wine! My good friend Cathy and I have been known to stop at a winery on our way to the annual knitting retreat in Guthrie. 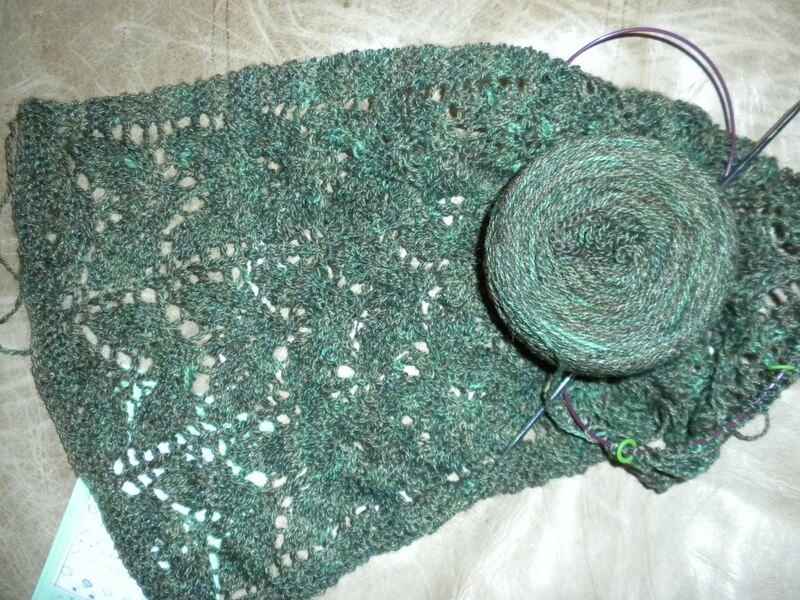 I’m using the Lost City Silk yarn in colorway Bacchus to knit Sangiovese, a large triangle lace shawl. I’m just starting the second repeat of the first chart and am quite happy with the progress thus far. PreviousPrevious post:Oklahoma Yarns – Now Online!NextNext post:Now on Facebook!